Wayne's Take: What do you do when you get a perfect score? Most games help improve more then one "brain area" and the goal is to steadily increase your "BPI" or Brain Performance Index. Which can be compared to others in your age group. I like some games while some are just a chore to play. I'm pretty even across the board in the areas with all my scores in the top 10% of my age group (40-45 year olds) and I've been stuck at 94% over all for a few weeks. I find it interesting that the games I like the most tend to be the word games because, honestly, I'm pretty bad at spelling. One game is Word Bubbles Rising. Where there are 3 stages each 1 minute long. The first stage you get a 2 letter prefix with which you enter in as many words beginning with those 2 letters as possible but it is a bit more complicated then that if you want to score well. Each word is worth so many points and you try to get 3 words of each length from 4-10 letters. Any words over 10 letters counts as a 10 letter word and a 3 letter word counts as a 4 letter word. After getting 3 words for a given length you get a "star" if you get a star for every length then each word after that gives a LOT of bonus points. Rounds 2 and 3 are similar but you start off with a 3 letter prefix in round 2 and a 4 letter prefix in round 3. Sounds like round 2 & 3 would be harder but not so. In round 2 after 30 seconds the last letter of the prefix is removed letting you create words with just the 2 letter prefix. So "sch" becomes "sc". Round 3 knocks of a letter at the 20 and 40 second point of the round. The game is a bit random because the prefixes are random, but you always get a prefix that some words start with. Some prefixes are much easier to make words with then others. With every word completed you rise from the sea bed a bit based on the number of points you got for that word. I've now had a few times where I've busted through the water's surface and started going into the sky. This game is good because you can almost always get better and you can replay to get better. Here is the dilemma. Since your BPI is an average of your scores do you stop playing when you've got a bunch of good scores? For a game like this you always have the opportunity to improve. But with other games there are caps to your score. Memory Matrix is a game where in 15 rounds you are shown some tiles in a grid for about 1-2 seconds before they go away and you have to click each spot in the grid where the tiles were. It starts out with a 3x3 grid with 3 tiles then each round tries to add 1 more tile and increases the dimensions of the grid by 1 unit in either width or height. You get points for every correct tile you pick but once you select a spot where a tile wasn't that round is over and the next round starts with 1 less tile then what you where on. If you get all the tile locations you get bonus points and the next round gets a little harder. Part of my problem with these games is there is a bit of a difference between how you should play to expand your mind and get smarter and just getting a higher "BPI" score. Ah well I'll keep playing to try to get smarter and just deal with the fact that some times my scores will dip down and not come back up to my "best" scores for a while. I don't need to be in the top 1% or even 5% of people that play these games. I'm happy with knowing my vocabulary and spelling is getting better. 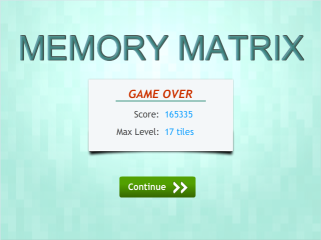 Oh I guess my memory is getting better too!